World of Warcraft’s new “communities” feature just launched. These communities are a lot like guilds, except they’re unconstrained by servers, which should be an easy win. Unfortunately, players have found some easily exploited blind spots in the new feature, as well as some drawbacks for marginalized players. WoW communities exist independently of guilds, so you can coordinate raid schedules with your guild while also signing on to chill in text and voice-connected communities dedicated to specific themes, like role-playing, pet-battling, or Satanism. In their current form, communities feel like Discord lite, all the way down to the fact that players have to receive invite links in order to join them. But as with other elements of the recently launched, widely panned Battle For Azeroth pre-patch, the aforementioned dark lord of power and pleasure is in the details. Right after launch, players voiced concerns about the design of the communities feature. These groups are limited to 200 characters, rather than accounts. So, if players want to add their alts (the other characters they’ve created), that’ll take up precious slots, plus those additional characters have to be manually invited, one by one. There’s also no in-game community browser, so finding the right one can be a chore, as can finding members for your own community. “I created a community for others with anxiety within the game thinking that this would be a working feature,” said a player in a WoW subreddit post about disappointment with communities, explaining that anxiety often keeps people from joining groups and guilds for dungeons and raids. “I’m sort of bummed about it.” The player is worried that, at the moment, no one can find their community; in a follow-up post, they wrote that anyone who wants to join should message them. Blizzard didn’t respond to request for comment before press time, but based on the current design of this feature, it looks like communities are meant to be fairly intimate affairs—small groups, links passed between close friends who share similar interests, and so on. However, after things got heated in a handful of threads attempting to recruit players to communities on WoW’s general forums, Blizzard created an official recruitment sub-forum, complete with a warning that posts should not violate the game’s code of conduct. Community founders can post their links, which has led to communities getting subject to both the public scrutiny that they would want from prospective members, but also, scrutiny they don’t want from people mocking the premise of certain groups. In particular, communities centered around players of color, as well as groups for female or for queer players, have seen blowback. The biggest LGBTQ+ community recruitment thread, for instance, has ballooned into a 14-page flame war. “I’m going to make a straight people group, for all of those proud to be straight... sounds ridiculous right? So does this group,” said one poster in the thread, among repeated refrains from others that “this is what Twitter is for.” These statements put the community members on the defensive, with some stepping up to justify the existence of a LGBTQ+ group. 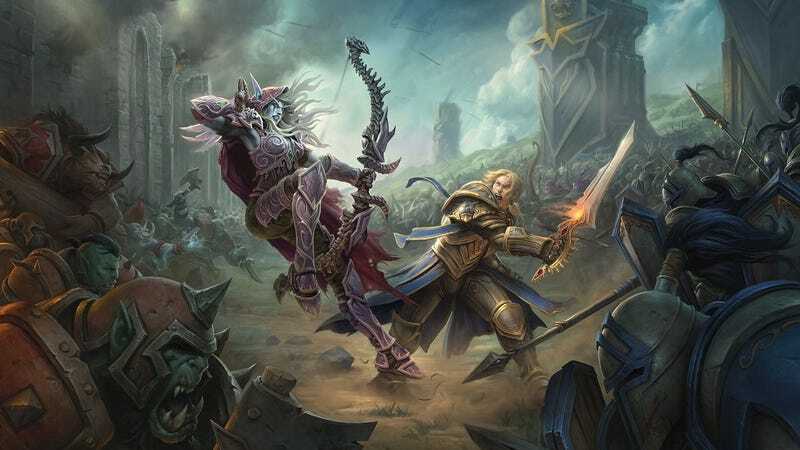 “LGBT groups are like any other groups, people talk about all kinds of things, everything from the weather, to wanting to get a raid group, to shipping Anduin with many lore characters, etc,” said one very patient player. It’s also easy for players to join a group just to troll its members. Players have pointed out that, at the moment, there’s no way for communities to ban people permanently. Anyone with an invite link can rejoin on an alternate character. Also, the communities tool doesn’t do a great job of explaining how community ranks and moderation privileges work, so players are still scrambling to keep their new groups in check. Posting invite links publicly—the only large-scale recruitment method currently available—doesn’t leave much room for vetting of new members. People join the community, and then players get to find out if they’re assholes or not. Even at that point, though, there isn’t a good way to get rid of them. “Most other queer people I know have always had trouble being queer online,” a player named SamuraiEmpoleon told Kotaku via DM. “Personally, I’ve been laughed out of guilds and raid groups by asking people to use my pronouns (feminine)... Communities are hard to moderate, they can hold up to 200 players, troublemakers can easily rejoin, and they have minimal features compared to guilds.” She added that she’s “heard horror stories” associated with communities, so for now, she’s sticking with an LGBT Discord she recently founded. Xhiel, a player who started one of the larger Reddit threads about communities’ loopholes, is even more skeptical. She thinks communities share too many flaws with guilds, with which she’s had bad experiences, despite being a good player. The structure of WoW’s guilds exacerbated the problem, according to Xhiel. Guilds and now communities are not directly regulated by Blizzard—unlike, say, public role-playing chat channels, which are. Xhiel thinks that communities more closely resemble custom chat channels, which tend to have flimsy moderation tools. If a bad actor gets ahold of the ban hammer, they can excise everyone from the group and shut it down. “Some particularly longstanding communities have paid the [subscriptions] of extremely old members to get their channels back under control after having a troll ban other members, and password protect the channel,” she said. Even the Satanist community is having trouble. The player who conjured the group from the darkest of flames ended up having to delete the link from WoW’s community recruitment forums.